The Bank is the first of our existing Big Bend cabins you can reserve at Ten Bits Ranch (XBR). We styled the outside of this cabin after the banks you see in old western movies. Plus the cabin provides an amazing view of Hen Egg Mountain from its spacious covered front porch. You’ll love the decor of this Big Bend cabin. The Bank contains two queen beds, a gas log fireplace, flat screen HD TVs (Dish Network), a private bath, Wifi access, air conditioning and the spacious covered front porch with an absolutely stunning view. As part of our grand plan, each XBR cabin fits into the overall design of our old western town. The decor reminds you of the late 1800s, but the amenities are as modern as modern gets. We survive completely off the grid with solar-powered energy. And we just might be more reliable than the power companies! XBR is within easy driving distance of all things Big Bend, including the national park and the towns of Study Butte and Terlingua. You can take it easy and hang out at XBR, or bring your ATVs and sport bikes and explore the surrounding desert and mountain landscapes. Or bring your guns and practice at the shooting range. And don’t forget to enjoy a hike along the Santa Elena Trail. Imagine a day exploring the Chihuahuan desert. Perhaps you prefer a simple hike through the desert trails. Either way, you can rest and relax when you return to the Bank for some good food, a cool desert evening and a night sky with stars that go on forever. 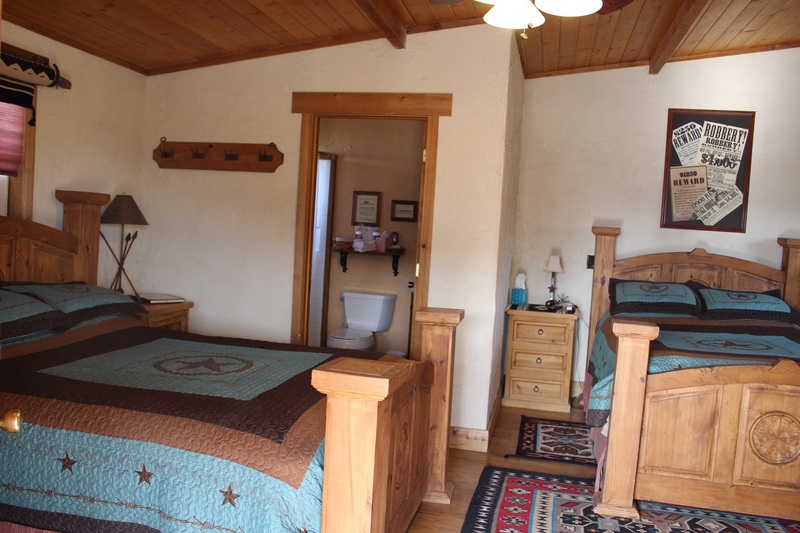 We fill up well in advance as do many Big Bend cabins, so make your reservation today. Call or email us – if we don’t answer, we’ll get back to you quickly.